Times are better for most people financially, but even if we are not feeling the pinch many are still watching their pennies closely – if they are wise. So how can we demonstrate the true value of Juice Plus+ to our customers and to those who are undecided about Juice Plus+? Unless they see that the value of Juice Plus+ exceeds the cost, why should they buy it or continue to? Results – in many cases the improved health of the Juice Plus+ customer more than justifies the cost (we can attest to that!) We don’t use testimonials to sell Juice Plus+ (don’t raise anyone’s expectations when you don’t know what they will experience); we are safer to say “Take Juice Plus+ for your health, not for your sickness”. However, individual results, including your own, are real and priceless. Ask the right questions during your Customer Care calls, and your customers will discover that Juice Plus+ really is working for them. Prevention – “an ounce of … is worth…” so much: you can’t feel prevention though, so the research powerfully demonstrates this (be sure to make your own research overview document at your Virtual Office (under Tools … Juice Plus+ materials … Brochures). Real savings – we spend nothing on medication and less on food than before (how about you?) The calculations in this document are fascinating, well-founded and conservative in our opinion. Comparison to fruits and vegetables – of course, this is a tricky comparison, because there isn’t a whole carrot or apple, etc. in the capsules, and we don’t say how many servings Juice Plus+ is equivalent to, but this comparison still makes people think. 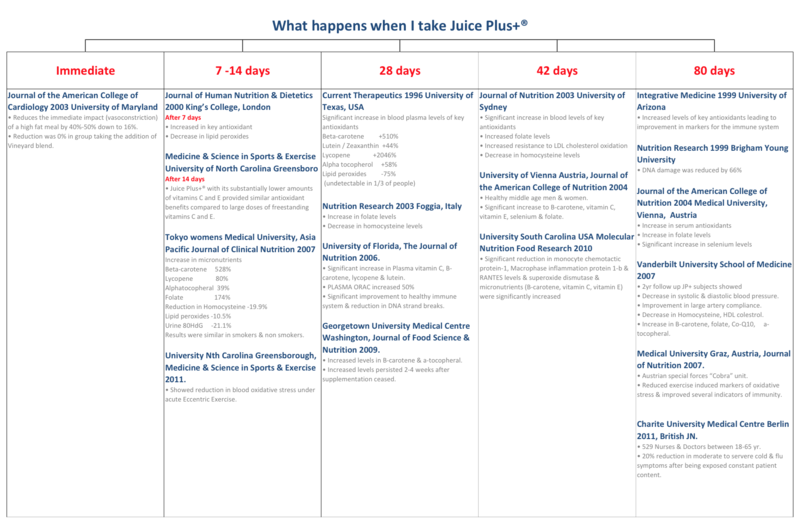 Also, as the research and real results indicate, there is a LOT of great nutrition in Juice Plus+! Comparison to common junk food – it’s fascinating what people spend their money on, and you can’t buy a simple black coffee or tea in most Starbucks for $2.30! This document is unique in that it compares Orchard, Garden and Vineyard … Priceless! So, what is the price of health, the cost of disease, the value of prevention? It’s in the ‘eye of the beholder’, and what you and I believe is not necessarily what our friends believe. However, it’s our responsibility to enthusiastically (communicating our own belief) give people information that will allow them to make an educated decision, if that’s what they want to do… if not, “Next”! This applies when you are Sharing Juice Plus+ and when you are giving world class Customer Care. Try one or two of those documents on your customers and prospects, and let us know what happens. You may find it easier to get 5 new customers every month, and to keep those you have.